Rapid prototyping does what it says on the tin. It involves building prototypes quickly for the purpose of testing various design features, functionality, output and performance of a product before going into full development. Having been born out of manufacturing, the process has been borrowed by a variety of industries and become a favourite of software developers, who have made it even quicker, as anything digital tends to do. Rapid prototyping helps to save money and time by identifying necessary features and eliminating redundant features early-on in the design process. It reduces the risk of running into vital problems later on in the development stage that can stretch timescales and budget. But above all, it opens up the channels of communication between all stakeholders in a project - users, developers and designers - from day one. This means that the detail of any product being developed can be pulled into sharp focus at the earliest stages of the design process. It can be as simple as paper sketches or something more technical like a wireframe, but it always follows the same pattern repeated multiple times, with each repetition refining the solution and sharpening the focus: build, test, iterate. It starts with thorough user research to gain an empathic understanding of the people you’re designing for and the problem you are trying to solve. This can take a number of forms from creating user personas defining how different users think, feel, see, hear, and do, to carrying out participatory research through interviews. A clear understanding of the user will help you to define the unknowns and map out user journeys so you can begin to generate ideas from a stronger vantage point. In turn, you have stronger ideas to prototype. 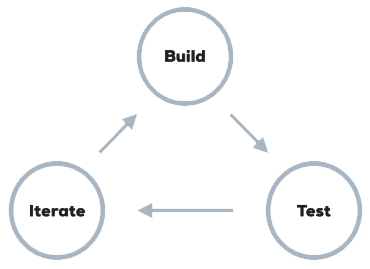 When it comes to building the prototype, the design principle “Keep it simple, stupid” (KISS) holds true. The complexity of prototype required only needs to match the level of questions you are trying to test. For instance, if you are just trying to answer questions about the visual design of a digital project then a pencil and paper could be sufficient, but if you need to answer questions about functionality and usability, then you would be better served by a prototyping software tool. Hence prototypes can range from low fidelity like paper sketches, to something a bit more developed like a static wireframe on UXPin, or something even more developed like a functioning prototype with full look and feel on Adobe XD or InVision. Once the prototype is ready then it’s time for the most important component of rapid prototyping: user testing and gathering feedback. Being able to put the learnings back into the design is what leads to building a stronger product. The key is to focus on what you want to learn and prepare test scenarios to reflect that. Whether its usability testing you require, A/B testing small variations, beta testing to validate the product or just surveys, there are plenty of software tools to facilitate it. Be sure to ask for honest feedback and avoid testing with users that are going to be biased. And capture the results in a way that will give you the full picture from Google Analytics, to heat maps or eye tracking tools, as what people say might not be what they do. Finally, iterate and do it all again. Not all feedback will go back into the product, you have to decide what are primary issues and what are inconsequential. Then addressing the primary issues, create a new prototype and begin the process all over again until you are satisfied that you’ve reached the best possible product for release to the market.